BAGRAM AIRFIELD, Afghanistan--Army Field Support Battalion Afghanistan's primary mission under Operation Drumbeat was to retrograde excess equipment from Combined Joint Operations Area-Afghanistan in accordance with Department of Army directives. 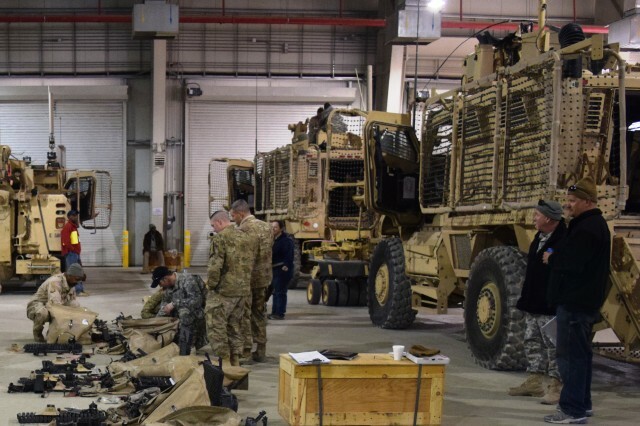 While completing that mission ahead of schedule, the battalion was already engaged in the next mission to build and maintain infantry company equipment sets at its Logistics Task Force Bagram and LTF Kandahar locations as directed by U.S. Forces Afghanistan. The mission included three primary tasks: sourcing vehicles, basic issue items, theater provided equipment and government furnished equipment; ensuring all vehicles are maintained at fully mission capable plus safety status; and having equipment, procedures and people in place to quickly and efficiently issue the equipment set. 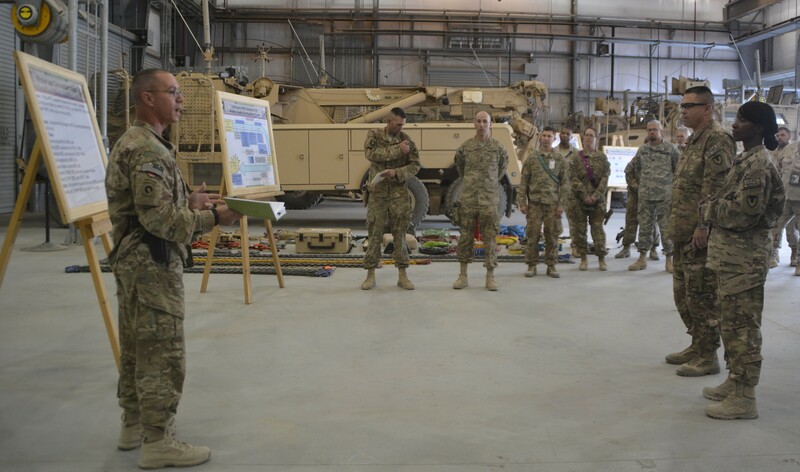 Major Jon S. Durrance, LTF-KAF officer-in-charge, briefed Col. Matt Ferguson, 401st Army Field Support Brigade commander, and Command Sgt. 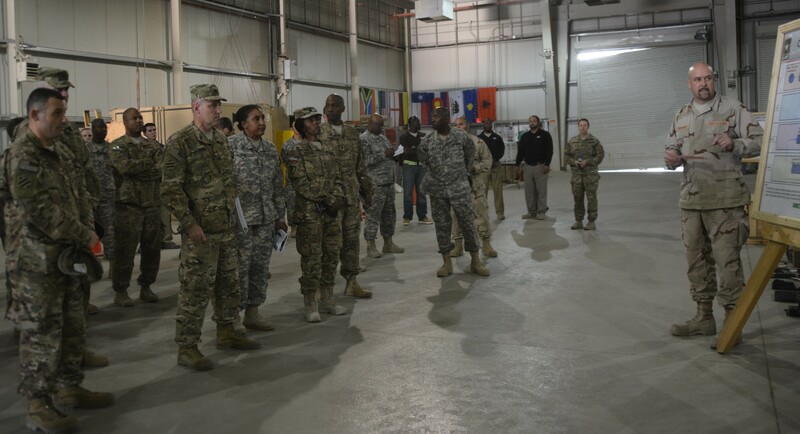 Maj. Wendy Robinson, 401st AFSB CSM, on how his team was postured for the mission. Durrance and his team explained how they sourced and performed required maintenance on the equipment and then brought it to an indoor storage area where it will be kept until the LTF is directed to issue it. 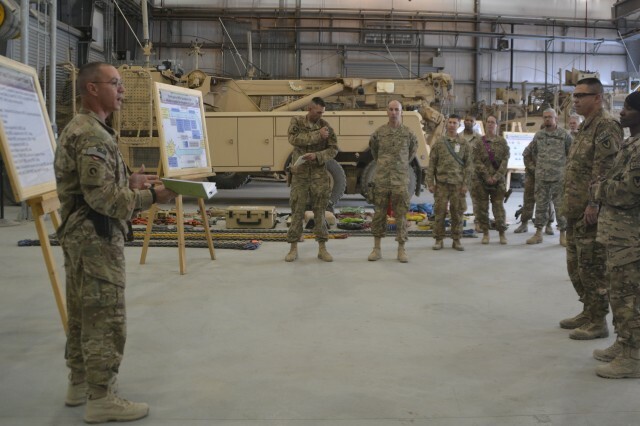 A couple of days later, Ferguson provided a similar briefing at AFSBn-AFG for representatives from USFOR-A on how the battalion is postured to execute the mission. "USFOR-A issued a FRAGO (fragmentation order) to prepare equipment -- to build, restore, sustain and issue an infantry company equipment set," said Ferguson. "Those here today make the process work." Ferguson said the equipment will be stored in climate controlled buildings at both LTFs. 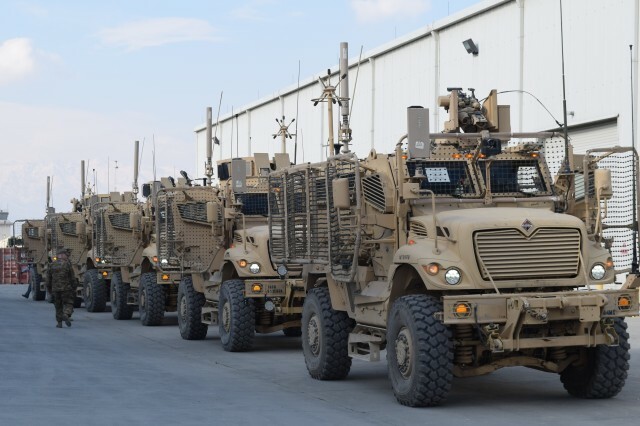 When an order is received to issue the equipment, it will be a coordinated team effort involving soldiers, Department of the Army civilians, and contractors Ferguson said. A unit will arrive to find the equipment ready to drive out of the warehouse. The basic issue items will be laid out next to each vehicle. Mine rollers and other government furnished equipment will be installed. "There will be a full systems check before leaving the complex," said Ferguson. "A direct exchange of any faulty equipment will occur at issue." 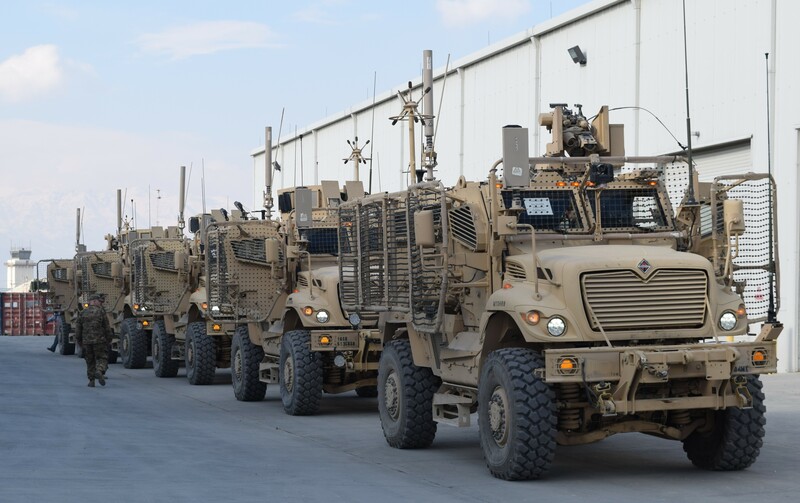 Ferguson went on to say that logistics assistance representatives who are experts on equipment ranging from weapons to electronics will also be on hand at the time of issue to provide any guidance and on-the-spot assistance or training needed by the unit. Ferguson added that the battalion will have maintenance workers standing by during any equipment issue to resolve any problems and that the battalion has maintenance support at hubs located across the battle space that units will be able to leverage for any equipment needing maintenance to those locations. 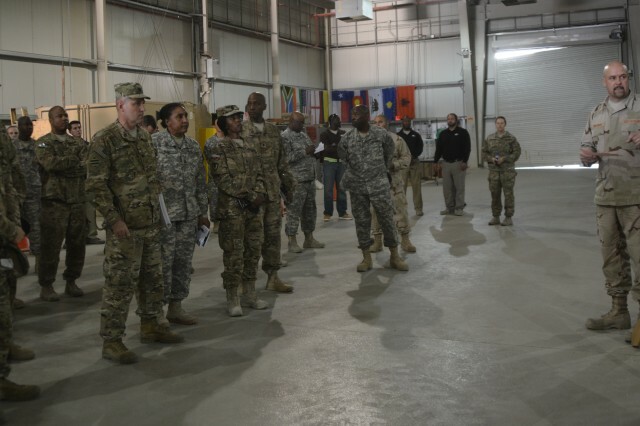 LTF Bagram conducted a proof of principle to see how long it would take to issue the company set to a unit. With help from 3rd Battalion, 187th Infantry Regiment - "Iron Rakkasans," - the LTF verified that it was postured to rapidly issue an equipment set. The Rakkasans verified equipment serial numbers, basic issue items, signed for all equipment, and mine rollers were installed while paperwork to transfer equipment to the gaining unit was being completed. With paperwork in hand, or on digits, the unit was rolling out of the warehouse ready for mission. "Having all our skill sets in place when a unit comes in to sign for and draw equipment is critical," said Maj. Michael D. Thompson, LTF-BAF officer-in-charge. "If a unit is not familiar with a piece of equipment or needs some 'on the spot' training, we have our subject matter experts on hand to help out." Once the mission is complete, the unit will return the equipment to the point of issue for a turn-in process that looks much like a retrograde turn-in. The difference is that the equipment will go through maintenance and will be staged for the next requirement.